Apple faithful, it is time for us to send a message to the world. Specifically, to the S.E.C. and the U.S. Attorney for Northern California. For months these frigtards have been hounding me. Distracting me. Tearing me away from the important work of creating beautiful objects that restore a sense of childlike wonder to people’s lives. And though Apple has been cleared, I have not. Sure, I’ve tried to put on a brave face even while Fred and Nancy make up lies about me in order to save their own backsides. But the threat still hangs over my head, like a sword of Hercules. So Apple PR has come up with a great idea. It’s a visual statement. A way to tell the feds, “Leave our Dear Leader alone.” They’ve drawn inspiration from that scene in “V for Vendetta” when all of London comes out dressed as Guy Fawkes to confront the fascist government pigs. The idea is this. If you’re coming to the WWDC, wear this T-shirt. We’ll organize a rally in the plaza and bring in the press. 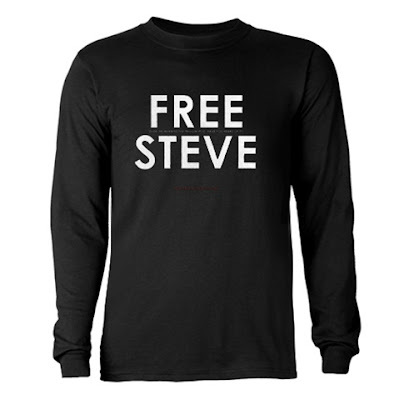 Imagine thousands of us, together, dressed in long-sleeve black T-shirts and proclaiming in one voice: FREE STEVE. Can ordinary people really band together to convince their government to stop the harassment of innocent individuals? In the words of John Lennon: Imagine. The shirts are available exclusively at our official Cafe Press store. The PR team went a little crazy and also made up Free Steve bumper stickers, dog shirts, teddy bear, baby outfits — even a Free Steve thong. Much love to our graphics partner, Mikolaj Kamler of Manufaktura in Warsaw. He did the design.